10th PARALLEL takes us on a 300-mile journey up Brazil's Envira river into the heart of the Amazon Rainforest, to the frontier of a territory populated by the country's uncontacted indigenous tribes. Our guide is Jose Carlos Meirelles, a sertanista - one of the Amazon frontiersman employed by FUNAI, the National Indian Foundation of Brazil. With anthropologist Txai Terri de Aquino, he leads us to the Ethno-Environmental Protection Front of the Envira River, a FUNAI outpost he founded at the foot of the 10th Parallel South, the latitude that marks Brazil's border with Peru, cheek by jowl with the largest population of isolated indigenous people in the world. Until 1987, FUNAI attempted to make contact with previously isolated tribes and integrate them within the Brazilian state. The policy had disastrous results: the death of hundreds of thousands of indigenous people, and, in some cases, the virtual enslavement of others on behalf of government or industry. 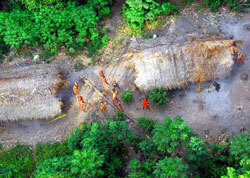 Since then, FUNAI has sought to maintain these tribes' isolation. Sertanistas like Meirelles, the very people who used to make first contact with the tribes on behalf of the government, are now charged with ensuring the new policy is observed. 10th PARALLEL documents 21 days of this frequently dangerous, always delicate labor. With few resources beyond decades of experience in the indigenous cause, the specialists negotiate with the established riverside indigenous communities, and face traffickers and squatters who try to invade the area. Meirelles describes sometimes harrowing encounters with members of the uncontacted tribes, including an ambush during which he was pierced through the face and neck with arrows. Even more than his bravery, we see Meirelles' dedication. In his meetings with the previously contacted and settled riverside tribes who live closest to the isolated communities, we see some of the thorny practicalities entailed by FUNAI's approach. After a number of conflicts and thefts involving the "wild" Indians, with casualties on both sides, Meirelles must propose possible solutions for peaceful coexistence, offering concessions on behalf of the government to the contacted indigenous communities that have suffered the greatest losses. 10th PARALLEL brings us deep into the Amazon and into close proximity with the rainforest's uncontacted populations to reveal the fascinating and complex issues at stake in FUNAI's policy on isolated tribes - a policy that has become a reference worldwide. We see that non-contact is not a policy of passivity or neglect, but rather entails all the subtle questions and balancing of constituencies as any other government program. The oil company MAXUS and Huaroni Indians of the Amazon. Seven Brazilian teenagers film their housemaids, exposing issues of class, race, and gender in their families, and in their country. By assigning financial value to elements of nature, can markets save the planet?